The Nasutitermes exitiosus is a subterranean termite, and like other subterranean species, they undergo an incomplete metamorphosis, represented by egg, nymph, and adult. The nymphs will develop into either soldiers or workers in a general colony. If the colony is a mature one, alates will be hatched, sent through underground networks to develop new colonies. The adults are represented by four different castes. The queen and king are sent through underground networks from a mature colony to develop a new colony. Sub-colonies are usually formed by a supplementary queen. 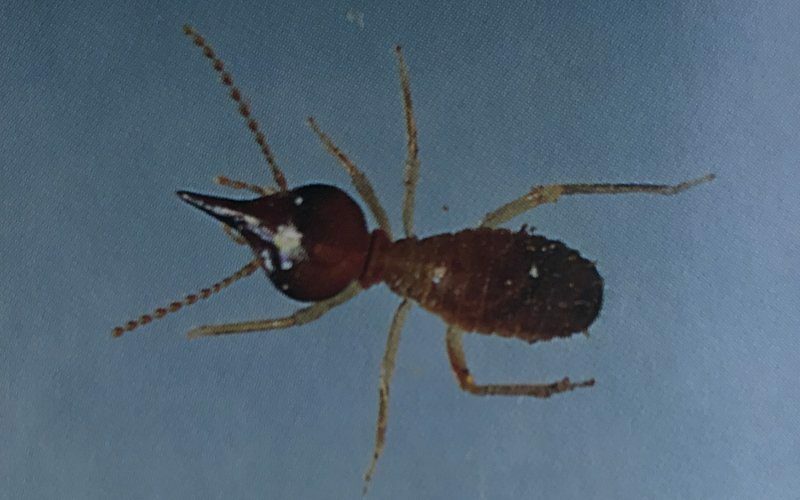 The primary queen of a colony can be anywhere from 25-30 mm in length. This is the largest caste within the colony. They perform all the necessary tasks within a colony, including helping with defense when necessary. Their primary function is foraging for food. The workers do not reproduce, and they are wingless and blind. They have a thin cuticle and their antennae are in 14 segments. They are partially transparent, though whiter in coloring. The workers can be up to 4.5 mm in length. This is the most distinctive caste, with the fused mandible allowing them to act in defense of the colony. With the snout created by the fusion, the soldier can shoot a chemical, much like threading that holds an intruder in place, and emits a pheromone attracting other soldiers to help in the attack. The soldiers are wingless and blind, as well as sterile. They have the smallest bodies in the colony, being as small as 3.6 mm, up to 4.8 mm in length. They have a thin cuticle, and their antennae are in 13 segments. The soldier is cream-colored with a distinctive dark brown head, with a harder structure than the other castes allowing them to defend the colony. The alates are the reproductive caste of the colony. They only develop in mature colonies and are sent through underground systems to create new or sub-colonies. They have four wings, of equal size to their bodies. The alates have a denser cuticle than the workers and soldiers. They have larger bodies than the workers and soldiers, being anywhere from 15.5-17.5 mm in length, and of the three, are the only ones able to see, having compound eyes. Their antennae are in 15 segments. The alates are dark brown to black in coloring. The nasutitermes exitiosus are found most commonly in New South Wales and Canberra, though they can also be found in southern areas of Queensland including northern NSW and Western Australia. They like to create colonies in urban areas, especially near eucalypt gum trees. The colony is usually an above ground mound, 30-75 cm high. Their mounds can be up to 100 cm wide. In drier areas, they may nest in trees or stumps, and sometimes can be found in wall cavities or under floors. In some cases, they may build nests underground in these drier areas, only leaving bare earth over the colony. These termites attack hardwood and workers are willing to travel up to 50 metres for food. They prefer sapwood and will cause significant damage to underground sources and buildings when nesting underneath them unnoticed. They are averse to pine woods and seem to prefer eucalypt gum trees as their primary food source, though any non-rotted hardwood is acceptable. This breed of termite is considered a low-risk Termite if your home is made of pine and a High-risk Termite if your home has hardwood construction or hardwood flooring, their nests are usually easy to spot, and removal can be successful when done professionally. If left unnoticed however, they can cause severe damage to hardwood structures & trees. They can also cause considerable damage to wood structures such as bridges and fences if left unchecked. They are in areas from Southern Queensland to New South Wales, where they are most prominent. In drier areas, they can be harder to spot, making it easier for them to cause more damage. As workers are the ones that go in search of food, they cause the most damage to structures.